I hiked in early today along the Bradford Ridge Trail reaching the springs at 7:00 am. Nice cool weather at that hour and a very peaceful hike. Looking at the springs from Bradford Ridge, it appeared very quiet with no activity in the pools. As I arrived however, I could see a couple groups of campers still sleeping and one fellow was just entering the Womb. The water in the Womb was very nice, but the water in the Serenity Pool just below the Womb was actually cooler for a change. All the hot water from the Crab Cooker was being diverted into the creek. Some of the rock sculpture that neogeo noted (8-23) was still present in the creek. These were very cool. 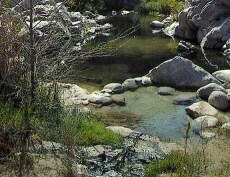 A very calm, peaceful morning, I soaked in the Womb and the Serenity Pool for an hour or so and also swam in the creek. A few of the campers came to soak in the Womb as they woke and several lay out on the rocks in the morning sun. A group on the beach made breakfast (or coffee) and seemed to enjoy morning conversation and a “drum circle”. The morning was comfortably cool and still, until a nice light breeze stirred up around 8:30 or so. A couple groups of hikers and a trail runner arrived at the creek from Bowen Ranch after about 9:30. Some soaked or visited and one group moved up creek. When I left there were probably about 15 people at the springs or just up creek. Most were under the trees, the trail runner was in the Womb.